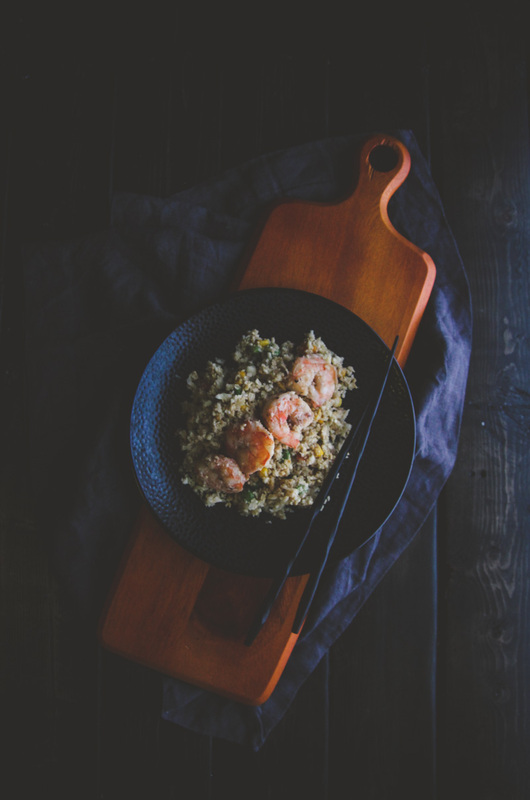 Skip the takeout and make the the best shrimp cauliflower “fried rice” – a delicious and healthy alternative to fast food, and seriously sooo good, I’ve made it a bunch of times and perfected the recipe for you! If you follow me on Snapchat (username: SweetPhi) you probably already know that I’m obsessed with shrimp cauliflower fried rice, you’re probably rolling your eyes because you’ve seen me have it SO MANY TIMES since sharing a behind the scenes snap when I was originally recipe testing. I’ve been teasing at coming up with the perfect recipe, and after making it over 6 times (to be honest, I’ve lost count of how many times I’ve made it at this point, it’s THAT GOOD!) I’ve perfected it. 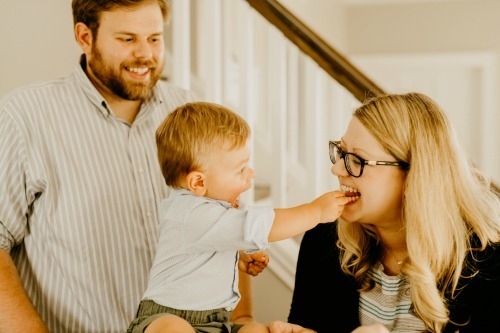 Little side note here – speaking of perfect things, this past weekend was so wonderful. I didn’t work at all over the weekend. 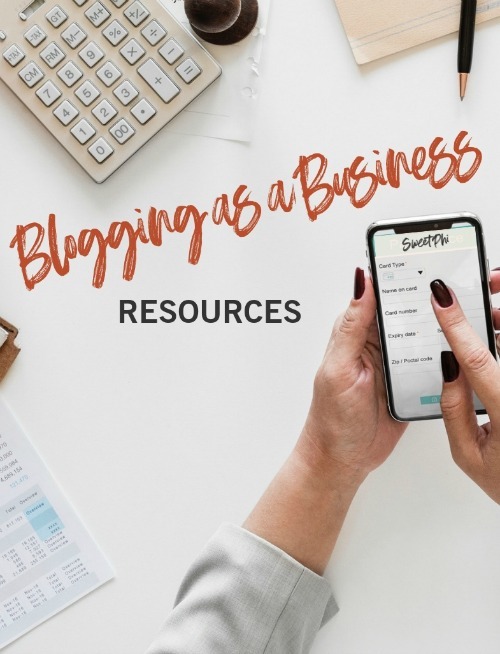 No blog, no work-work, nothing! I spent the weekend with my hubby and family and friends. Friday night we had a wedding, then Saturday we walked Clover (our dog) to her grooming appointment, walked to brunch (our neighborhood is picking up) and then went to the farmers market and watched a movie ( Zootopia-yes it’s a kids movie, but it’s super cute). Then on Sunday I planted my vegetable garden, went over to Nicks’ grandmas house and then to his parents house for Sunday family dinner. It was glorious, it felt so relaxing and just what I had been needing. Do you ever have amazing weekends like that? Ok, so back to the recipe – you know how I feel about the term ‘the best’ – it has to truly be amazing, something I make over and over and over and that other people agree is the best (like the best salted caramel chocolate chip cookies – they straight up rock). 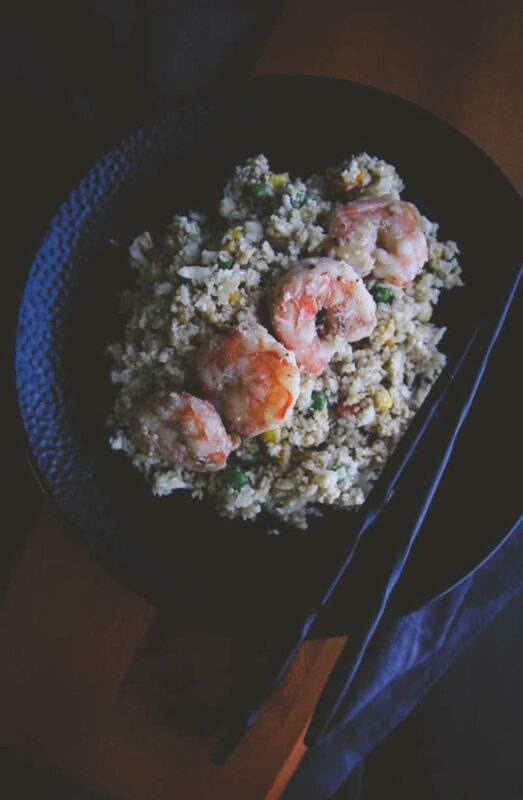 This shrimp cauliflower fried rice, it is the best. You could use a wok to make this if you have one (I need to get this one because the last one I bought years ago had a wooden handle that caught on fire!) but I just use a big pot. So the first time I made this – it was good, but holy ginger – I went a little over board with fresh grated ginger. The next time I made it, there was too much garlic and I really didn’t like the pungent garlic , I solved that problem by adding garlic salt vs. fresh garlic, that little tweak really made a difference. The third time I realized I really didn’t like the sugar snap peas I had originally added in there (I shared this pic on instagram of when I made it) – they were just too big to have on a spoon, so I took them out. Then I perfected the recipe and have made it the exact same way since! 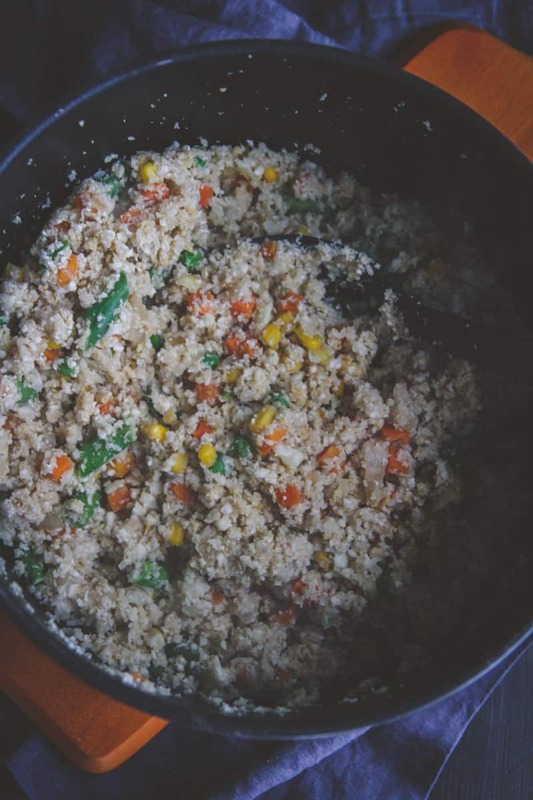 A little note on the “cauliflower rice” – I found some “riced” cauliflower at Trader Joes, but since I don’t go there all the time and wanted to make cauliflower fried rice, I made it at home – just as amazing. All you do to make the cauliflower into rice is cut up a head of cauliflower and run it through the food processor (the first time I made cauliflower rice with this cashew curry cauliflower rice) I was surprised at how easy it was. And again, when I make it now, I’m always so surprised at how easy it is, you should totally give it a try. If you don’t have a food processor, you can cut the cauliflower super finely with a knife – it may take a little more time, but is totally doable. When I made this and gave it to my hubby for dinner- he said he wouldn’t have known it was cauliflower fried rice if he wouldn’t have known (I may have been exclaiming to high heavens how amazing the pre-riced cauliflower was and how the dish was so amazing as I was cooking it). My last little tip is to be sure to have everything set up/prepped before starting to cook. This dish cooks really fast – yay for 15 minute dinners, so you don’t want to be chopping or looking for something when you’re in the middle of the dish. 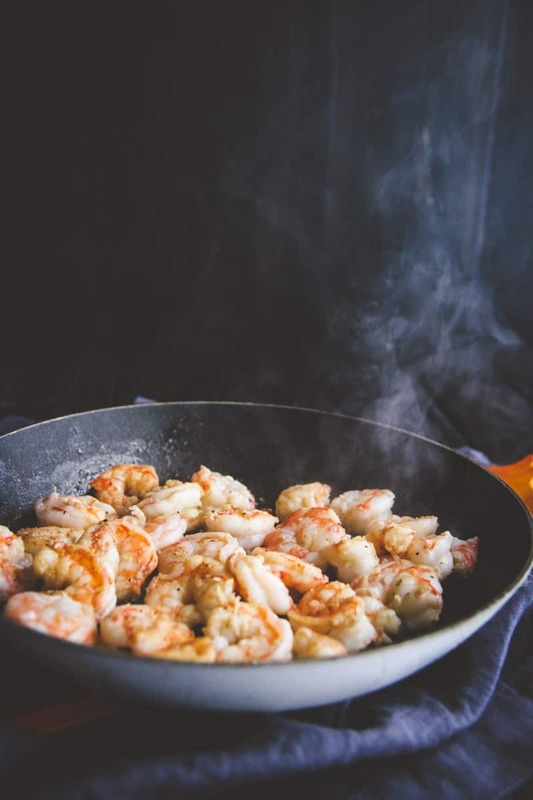 To make the shrimp simply add the shrimp, salt, garlic salt, pepper, vegetable oil, sesame oil and soy sauce into a large skillet and cook over high heat, until the shrimp is no longer translucent and is cooked through (about 10 minutes, stirring occasionally). Have your cauliflower riced and ready to go. Combine the 2 eggs with 1 teaspoon sesame oil in a separate bowl and beat and set aside. To make the cauliflower fried rice in a large pot combine 1 tablespoon vegetable oil and 1 tablespoon soy sauce with chopped onions and garlic salt and a pinch of salt and pepper. Cook over high heat stirring occasionally for 2 minutes, until the onions start to turn translucent and are fragrant. 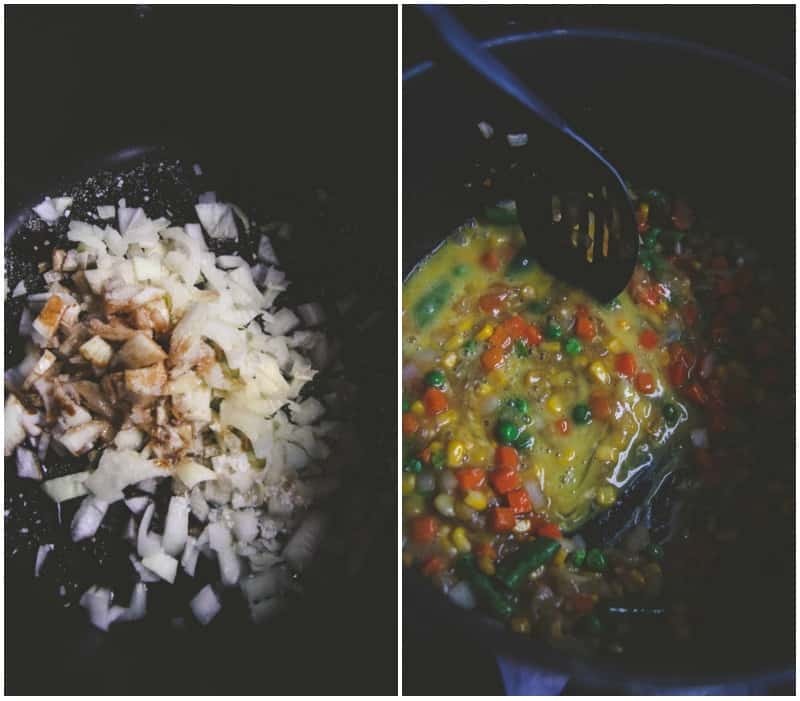 Add the frozen vegetables to the pot and cook for 2 minutes, so that they begin to thaw. Pour in the egg mixture and stir for 1 minute, until the egg appears to be cooked. Add in the riced cauliflower and remaining tablespoon soy sauce and stir and cook on high for 5-7 minutes, stirring occasionally. Check for cauliflower 'doneness' - you want the cauliflower to not be hard anymore. 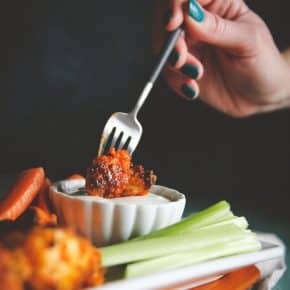 To serve divide the cauliflower among four plates or bowls and top with shrimp, then enjoy. We usually do half rice and hald cauliflower “rice” when we make fried rice. It makes it nice and lighter. 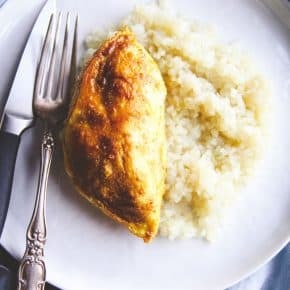 I love that you do half rice half cauliflower rice, I’ve just done all of one or the other, I’ll have to try that combo some time. This dish though- omg, it’s soooo good! It definitely is nice to just turn off and unplug every once in a while, isn’t it? I guess I hadn’t done that in a while, and it was so needed and amazing. 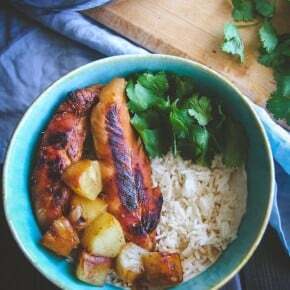 and girl, this recipe, soooo good – you wouldn’t even miss the carbs in this recipe! Thank you so much girl, it’s one of my faves, I think you’d love it! I’m so obsessed with this dish, I’m even making it again this weekend, it’s truly delish 🙂 Thank you so much for commenting. What a beautiful dish Phi! I recently tried “cauli rice’ for the first time a few days ago and was pleasantly surprised. Gotta try it fried! Beautiful photos as always, too! Thank you so much for your lovely comment and complimens. 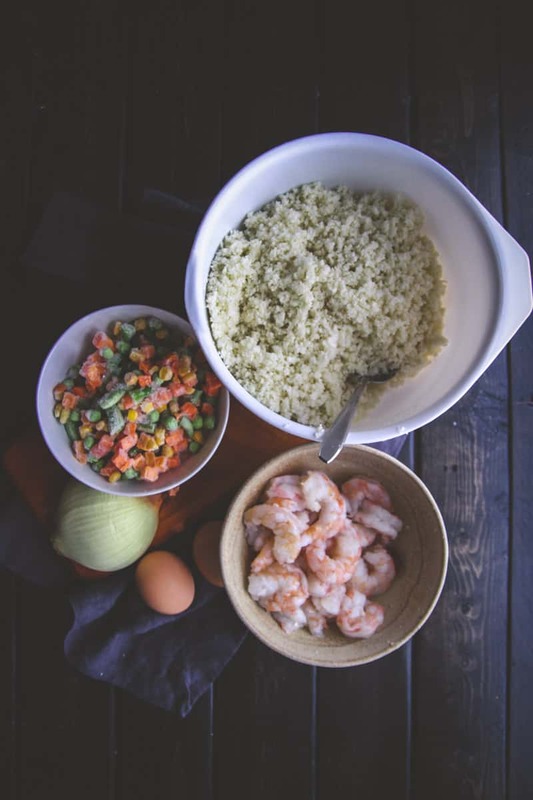 Cauliflower rice is my new fave, it’s sooo good and made into shrimp cauliflower fried rice? Yummmm! You have to try it! Hello would this be okay to keep in the fridge and heat up for the next day? Absolutely! This is one of my favorite meals for lunches, it reheats really well!! How would you alter the recipe if you’re using frozen shrimp? Sorry to be so late to this thread, but cooking shrimp for 10 minutes? Um, no. 😀 Whew! Thought I’d gone off my gourd. BTW, I made this (cooking shrimp less than 10 mins LOL) and it was delicious! Thank you so much! !